Summer is reappearing for a bit, giving a co-worker a gorgeous wedding day today. Here's a peek at two of Wisconsin's fine state parks, which I visited during another beautiful week, this one during vacation last month. 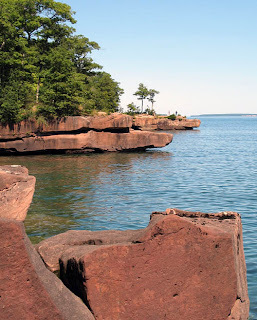 Big Bay State Park on Madeline Island has a clean, sandy beach, plus a fun hiking trail where you can climb onto the rocks and enjoy Lake Superior, unobstructed. 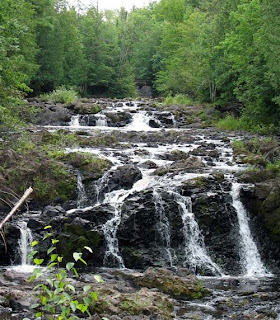 Copper Falls State Park has rivers, rocks, and falls. The nice down-and-up hiking trail and scenic views, plus neat CCC log buildings, make this hike acceptable, even without a beach.